Let's kick off the weekend right!!!!! 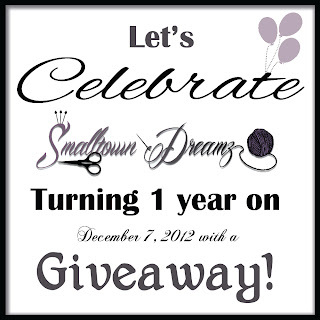 Today starts is the first day of the Smalltown Dreamz Celebration Giveaway! Entry Details and the Rafflecopter to enter the giveaway can be found by clicking on the Celebration image below. I will be giving away 2 free patterns of winners choice. The winner that gets to pick their patterns will have 1 year to choose. I hope you get a chance to enter. I look forward to another great year with you all. Thanksgiving is right around the corner and even though I don't have to really worry about to much, I am still feeling behind. I do have 2 local craft shows coming up here Dec 1st and the 8th. I am so excited. This will be my first round of craft fairs that I will participate in. I have to admit I am a bit nervous but I have decided that even if I don't do well at those, I will try again at some different shows next year. Well I hope you all have a great weekend. What projects will you be working on? Check and see whats new at my sister site. Pattern Giveaway and a Celebration! !